Not your great-great-grandfather’s War of the Worlds. Throughout the entirety of this book’s length, I was thinking of how best to frame it to you guys. Because I think it’s really good, and I want more people to read it. I have a soft spot for end-of-the-world/invasion/post-apocalyptic fiction, and Fear the Sky offered me something wholly different and unexpected: a rich story that isn’t just a vehicle for the decimation of society. Imagine Independence Day, only the aliens are smart enough to send (ten years in advance of their invasion fleet) a scouting party designed to disrupt humanity’s defensive capabilities. And the aliens, never mind being technologically more advanced than us, are actually fairly well developed and complex. These invaders aren’t a homogeneous and monolithic species hellbent on our destruction, they’re an alien version of the UN, with their own political machinations and internal strife. They don’t all want the same thing, and aren’t all willing to go to the same lengths to achieve their ends. All of that is but the backdrop to Fear the Sky. This isn’t Independence Day. Nor, really, is this War of the Worlds. This is more like the espionage/political thriller Munich, tinged with WWII resistance fighters.. 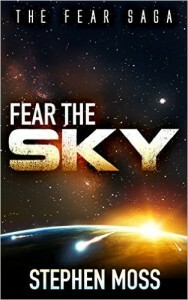 Fear the Sky has a fairly large cast of characters, and is told from multiple points of view (protagonist and antagonist), and isn’t afraid to actually explore the motivations of the alien invaders. We’re over-matched, here, and the good guys don’t always win. My biggest issue is that there is sometimes too much of a focus on the espionage and resistance planning, and not nearly enough on character. Further, the book lacks an anchor. There isn’t much of a consistent voice throughout the narrative to tie everything together. The closest thing we get to this is the character Neal, but his role is pretty superfluous after he discovers the alien threat and builds the resistance movement in response to it. We have a central cast of characters that aren’t as fully realized as I’d like, and seem constantly at risk of drowning beneath the torrent of the book’s plot (which, I think, should instead be providing the forward momentum for the characters). Moss will, at times, flirt with characterization, but his strength seems to be in how this war unfolds, not in the humans at the center of the struggle, or the effect the conflict has on them. I found the book sufficiently captivating, but for people not drawn to political thrillers, Fear the Sky may leave something to be desired. There is also, just beyond the scope of my consciousness, a worldview represented here that I didn’t quite place my finger on. There’s some commentary on the wars in Afghanistan/Iraq, the foreign policy of the United States, but the military is at the center of this story, and isn’t depicted negatively. Political leadership is presented as more of an afterthought, but I don’t think the stance here is obliquely anti-authoritarian. In the follow-up books in teh series, I’m hoping to get a better read on whatever it is I’m missing. An interesting world is set up, here, and Stephen Moss has done a great job lining up the pieces for a very interesting series. I just hope he doesn’t drown in the intricacies of his plot. Share the post "Not your great-great-grandfather’s War of the Worlds." I've been doing this since 2015, and though I'm not going to read a hundred books a year, I plan on doing this for the foreseeable future. I also maintain the Cannonball Read database, and make infrequent updates on our reading habits. Why haven’t I read all of Brandon Sanderson’s books? Well, the first book (at least) isn’t really in the “end-of-the-world/invasion/post-apocalyptic” genre. I can’t speak for the rest of the series, though. ooohhh… I see why you suggested this one for our next book club. I have it on the long list. I’m hoping to parse it down to 6 options. I can’t wait, whatever book we go with.